Aurora Labs, an Australian metal 3D printer manufacturer, has announced that tests of its metal additive manufacturing process Rapid Manufacturing Technology (RMT) have achieved print speeds of 113 kg per day. Stainless steel rhombus ball created using Rapid Manufacturing Technology. Photo via Aurora Labs. Similar to Direct Metal Laser Sintering (DMLS), Aurora Labs’ Multi Concurrent Printing (MCP) within RMT melts and fuses layers of powder to form 3D models. Nevertheless, MCP lays down multiple layers of powder at the same time; during this process, an area behind each powder gate allows for multiple spaces for 3D printing. Several months ago, the company successfully 3D printed the first component with a complex lattice structure using RMT. 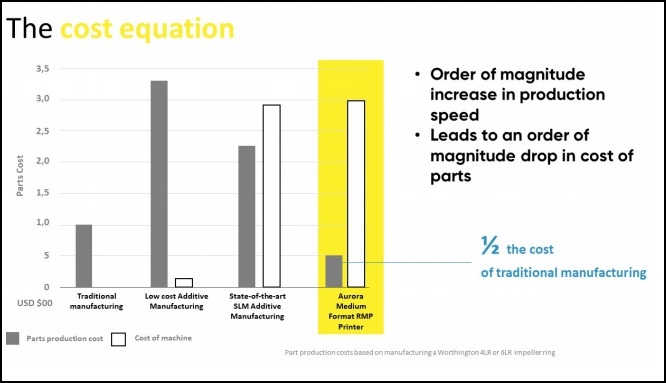 This was done at a print speed evaluated to be eight times greater than Aurora Labs’ defined standard market speed of a 3D printer with a similar size, which is 1.96 kg per day. Cost estimations as a result of RMT. Image via Aurora Labs. Remember, nominations for the 3D Printing Industry Awards 2019 are open. Tell us the enterprises, technology, and individuals leading the additive manufacturing sector. Featured image shows MCP within RMT in the Alpha 3D printer. Clip via Aurora Labs.